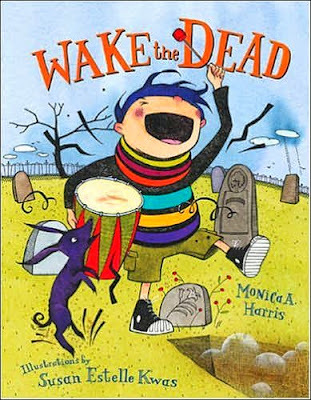 "Wake the Dead" starts off with a book lining featuring coffins and cute skulls. The title page then features an inscribed tombstone with the author's name and book title. Gutsy, for a children's book. 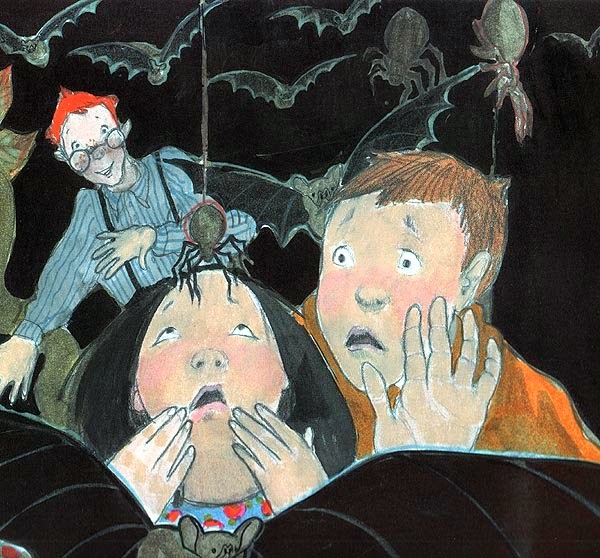 The main character, Henry, is so loud all the time that his mother warns him he'll wake the dead. Sure enough, he manages to wake them, and we're treated to a scene of (cute) skeletons rising from their graves in the nearby cemetery. The rest of the book is filled with puns and word play on the concept of being dead. I think my kid was slightly bored by the book, not "getting" the word play quite yet, but I personally enjoyed the artwork. In Maddie's Monster Dad, Maddie's father spends way too much time working on his computer and not enough quality time with her. She gets bored, and creates her own Frankenstein type monster dad, in a scene heavily inspired by the movie. (She uses a Build a a Beast boxed kit though). She gets bored with her toy, so luckily her dad comes around and spends more time with her. The artwork is mostly black, white and green. As a bonus, Maddie's hair is shaped like Lydia Deetz' (at least the bangs). Check out the Maddie's Monster Dad book trailer on YouTube. My kid was skeptical about Frank Was a Monster Who Wanted to Dance. The artwork on the front cover was a little too weird and offputting. Inside, the artwork only gets darker. I like that, but my kid was annoyed by the monster's bugging out eyes. 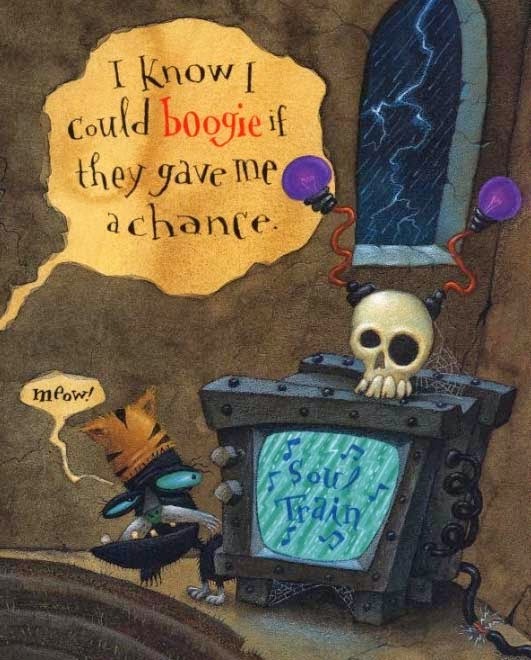 Still, the book's cute rhymes won him over. At one point Frank's head unzips and his gooey brains start oozing out - gross! His body parts start falling off on stage, and that got my little guy to finally enjoy the book. Seriously surprised this gory of a book was produced to begin with! Gutsy publisher. 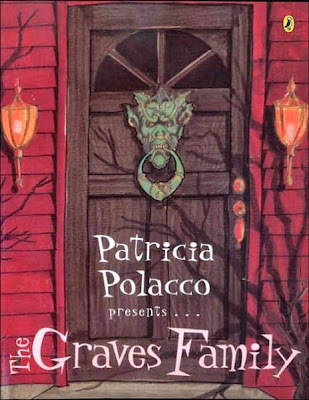 I was really enjoying the gothic imagery of The Graves Family by Patricia Polacco. The vocabulary inside though is too grown up compared to the other picture books we read - my young man wasn't quite ready for this. The sentences were too long, and the pages had way too much text on them. He got bored and went off to play, and I had to finish reading this all by myself. 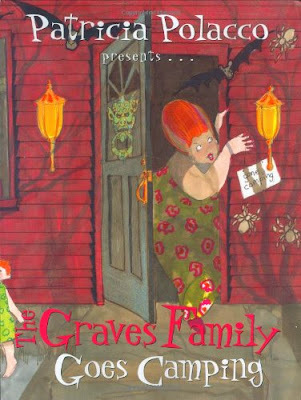 It cracks me up that the mom and dad's names are "Doug Graves" and "Shalleaux Graves." 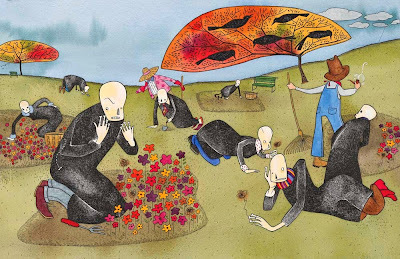 The book is about what happens when an unusual spooky family moves into a quiet small town. (I love that the first thing they do is to paint their house blood red). Next you get to explore the house through the eyes of the neighbor children, who are surprised at the pet spiders allowed to roam free and the laboratory in the basement. I wish my little boy had stuck around for the whole book, to hear the message that it's ok to be different. There's also a sequel available: The Graves Family Goes Camping.